A touchscreen is a nice solution, but when it is used to drive instruments, it is often not ideally placed, too small or too far from the eyes, subject to damage by corrosive liquid projections, expensive to replace when built-in, and not allowing updates or evolution… SAFAS brings you the solution : all the advantages of a touchscreen, without the drawbacks ! An ingenious flexible arm holds a big touchscreen in front of the face of the operator, exactly where he likes and out of reach of liquid sprays. Driving the instrument and following-up the measurements remain possible at any moment, even when the compartment lid is opened, so as the user can fully profit by the exclusive SAFAS technology enabling to measure at open sky, thus allowing easy injections of reagents during the experiments. 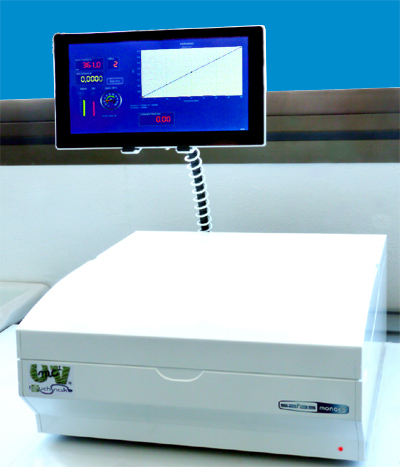 The touchscreen is built-in, but locked by a key ; so it cannot be stolen, and in conformity with the exclusive SAFAS concept of SUSTAINABLE SPECTROSCOPY, in case of damage, or just to profit by new technologies, it can easily be unlocked by the owner and replaced at low cost by any tablet from 8 to 12‘’ (autoadaptative) with Windows 8, fitted with Bluetooth or USB port. The software updates are free for instrument’s life. In order to facilitate the access to samples, the compartment is on the front of the instrument, full width. It can receive our ultra-fast optional cuvette holders for 10 or 12 cuvettes, aligned and stirred (guaranteed without rotative carousel nor staggered rows). The tungsten and deuterium lamp are autoaligning and long life, avoiding the major drawbacks of Xenon flashlamp. Performant and price-effective, the SAFAS UVmc TouchSnake are conforming to Pharmacopoeia with a nice safety margin. The optics are protected and mounted on aluminium holders and basis (no plastic !) and they are miniaturized, to provide a very small footprint (only 45cmx45cm). Thanks to their accuracy of 0.1nm, repeatability of 0.01nm and amazing stability, innovative analysis techniques are now possible. For safety reasons, there are no openings in the cabinet of the instrument, which is flat in order to enable to put a notebook on it, without requiring additional space on the table, the total footprint remaining to 45cm including the computer. For technical features of these models, please click here for the single-beam version, and here for the double-beam version.